VELCRO® Brand ONE-WRAP® Straps: These self-gripping fasteners, also known as Cable Straps allow for easy cable and cord management. 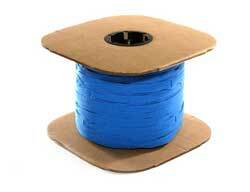 ONE-WRAP® straps are ideal for quick, dependable strapping for many applications. ONE-WRAP® straps are most commonly used to bundle computers cables, but are also used in electrical and automotive industries. The amount of actual uses are endless. Please call our knowledgeable staff for any questions you may have about this product or download the product information guide below. All of our straps are now available in 25, 50 & 100 count pucks as well as the full spool sizes below. We can make these pucks in the following colors: Black, Green, Lt. Grey Orange,Purple, Red, Royal, White & Yellow. Looking for a different configuration? Call 800-635-5252 and our expert staff will assist you with a quotation.